Telangana DSC 2017 SGT SA LP PET PD Online Applications Direct Link in TSPSC Official Website.TS TRT 2017 Teachers Recruitment Test 2017 SGT,SA,LP,PET,PD Online Applications,Eligibility Criteria,Age Relaxation,Vacancies,Roaster Caste Community Gender wise Subject wise Medium wise management ZP/Municipal/Government wise vacancies,District Wise Online Applicants for DSC 2017 Teachers Selection Exam,Download PDF file of Online Application, TSPSC DSC-2017 Exam Notification,Telangana TSPSC Online Application Form Submission for TS DSC TRT 2017 SGT SA LP PET @tspsc.gov.in. How to Apply for TS DSC TRT 2017,TS DSC TRT 2017 Online Application Form Submission @tspsc.gov.in.DSC TRT Telangana Teachers Recruitment Test Notification for SGT SA LP PET Vacancies,TSPSC Directrecruitment tspsc.gov.in Online Application Form, TS TRT(DSC) 2017 SGT/SA/LP/PET/PD Online application Form Download. 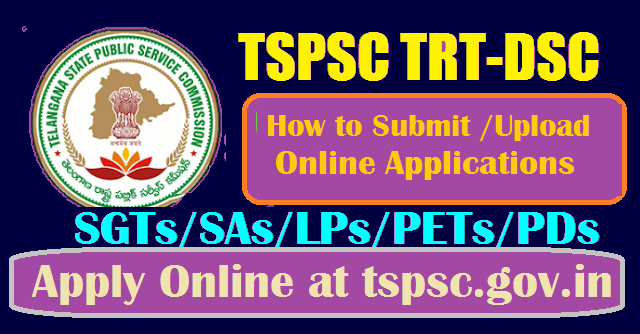 How to Apply for TSPSC TRT(DSC) 2017, Step by Step Procedure for Online Application Form Submission of TSPSC TRT(DSC) 2017 SA,SGT, PET, LP Apply Online at tsdsc.cgg.gov.in. Each applicant must pay Rs. 200/- (RUPEES TWO HUNDRED ONLY)towards Online Application Processing Fee, each subject applied for. This apart, the applicants have to payRS. 80/- (RUPEES EIGHTY ONLY)towards Examination Fee. b)Unemployed applicants in the age group of 18 to 44 years of Telangana State (They have to submit declaration at an appropriate time to the Commission that they are unemployed). How to Apply TSPSC Teacher Recruitment Test 2017 (TRT) Online?